The hotel is located in the Montserrat neighbourhood on the historical Avenida de Mayo just between Congress and the Government House the political axis of government activity. The hotel is very close to the center of the city and the more touristic neighborhoods like San Telmo Retiro Recoleta and Puerto Madero. The location is great because it is easily accessible by many bus and metro lines. The hotel faces the widest avenue in the world la Avenida 9 de Julio. All of the structures on this avenue symbolize the city`s history like Palacio Borolo Café Tortoni and Café Tres Billares. Make yourself at home in one of the 40 air-conditioned rooms featuring microwaves and LCD televisions. Rooms have private balconies. Complimentary wireless Internet access keeps you connected, and cable programming is available for your entertainment. Bathrooms have complimentary toiletries and hair dryers. With a stay at Bohemia Buenos Aires Hotel, you'll be centrally located in Buenos Aires, within a 10-minute drive of Plaza de Mayo and Florida Street. 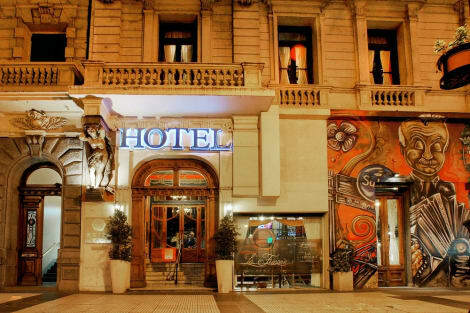 This hotel is 1.6 mi (2.6 km) from Obelisco and 1.9 mi (3.1 km) from Teatro Colon. It is situated in the best site of Buenos Aires, on the famous Corrientes Avenue, distant 20 meters from promenade Florida Street, where are big shows, art galleries, movies, theatres, restaurants and shoppings.The rooms have a unique style, offering comfort for the guest to enjoy your stay in pleasant surroundings. It is also very near from the most important banks, the historical center of the city, the government house and the famous new zone know as Puerto Madero, where you can meet a lot of "haute cuisine" restaurants and great enterprises buildings. Make yourself at home in one of the 30 air-conditioned rooms featuring kitchenettes with refrigerators and microwaves. Your pillowtop bed comes with down comforters and Egyptian cotton sheets. Wired and wireless Internet access is complimentary, and LCD televisions with cable programming provide entertainment. Conveniences include safes and desks, and housekeeping is provided on a limited basis. Make yourself at home in one of the 57 air-conditioned rooms featuring kitchenettes. 45-inch LCD televisions with cable programming provide entertainment, while complimentary wireless Internet access keeps you connected. Conveniences include phones, as well as laptop-compatible safes and desks. Make yourself at home in one of the 74 air-conditioned rooms featuring refrigerators and flat-screen televisions. Complimentary wireless Internet access keeps you connected, and cable programming is available for your entertainment. Private bathrooms with shower/tub combinations feature complimentary toiletries and hair dryers. Conveniences include safes and desks, and housekeeping is provided daily. 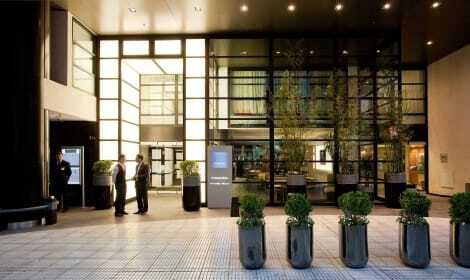 Hotel Chile in Buenos Aires is situated on Avenida de Mayo, 400 metres from the Obelisk and the Casa Rosada. The hotel offers air-conditioned rooms and a cafeteria. Guest rooms of the Chile Hotel have carpeted floors and include a cable TV and private bathroom. Free Wi-Fi is available in all public areas of the hotel. Breakfast is served daily in the spacious cafeteria. There is also a cosy lounge area where guest can read a newspaper or plan a new trip with the help of the 24-hour reception staff. Hotel Chile is situated 500 metres from the National Congress Palace and a 45-minute drive from Ezeiza International Aiport. Expect impromptu tango displays in city squares, noisy steakhouses, bustling markets and trendy clubs that will keep on pumping until dawn. It's difficult not to fall in love with the energy and colour that fills the heart of Buenos Aires. Stay at one of the numerous Buenos Aires hotels around the city centre and you'll be close to a great variety of sights. Visit Plaza de Mayo to view Casa Rosada – the Pink House – where famous Argentine leaders including Juan and Eva Perón once stood to greet the masses below. Take time to view the impressive art collections at the Museo Nacional De Arte Decorativo and Museo Nacional de Bellas Artes. At La Recoleta Cemetery you'll be able to view the grave of Eva Perón, as well as those belonging to numerous former presidents and cultural figures. There's also impressive architecture on show at Catedral Metropolitana and Basilica del Santisimo Sacramento. Teatro Colon is regarded as one of the city's major landmarks, as well as one of the top concert venues in the world. Experience an evening of ballet, opera or live music, or turn up in the daytime for a guided tour. Perhaps combine an evening meal with some live entertainment at one of the city's intimate venues such as La Ventana. Here you'll be able to tuck into a succulent steak while taking in a live tango show. However, you'll often get the chance to enjoy some excellent South American dancing simply by walking through the city's streets and stopping to watch the sensual moves of the talented street performers. Cultural events and festivals are held in the city throughout the year. With any luck your trip will coincide with spring's International Jazz Festival, August's World Tango Festival & World Cup, or perhaps the biennial Festival Internacional de Buenos Aires – a celebration of theatre that usually involves more than 50 companies from around the world. Fashion boutiques abound in Buenos Aires. If you're looking for some high heels for your tango lessons or perhaps a new outfit from an up-and-coming designer, you won't be disappointed with the choice on offer. Pick up some antiques or souvenirs in Buenos Aires' San Telmo district, or head to Palermo Soho to check out the latest fashion trends. City-centre shopping malls, including Galerías Pacífico, are home to high-end stores including Christian Dior and Hugo Boss. Many of the leading Buenos Aires hotels offer impressive menus and dishes from around the world. You'll have no problem hunting down great dining options, whether you're basing yourself right in the city centre or in one of the vibrant outlying neighbourhoods. The Puerto Madero waterfront district is known for its many restaurants, while the Palermo neighbourhood is regarded as the new home for cutting-edge cuisine. The Colombian-inspired dishes of I Latina have won the restaurant an impressive reputation, while La Bourgogne is considered one of the best bets for French food in the city. A visit to one of Buenos Aires' many steakhouses is a must.